From the map below, you will start the tour from the bottom to the top by the blue walking path. The first attraction is the King Rama I Monument (the red mark). From here, you will keep right and turn to “Jakkraphet” street to the Flower Market (pink mark). Along the street, you will see street vendors selling flowers and some vegetables. Later, you have to walk to “Mahaaraat” street to reach the 3rd attraction (Wat Phoo). The distance from the Flower Market to Wat Phoo (yellow mark) is around 3-4 bus stops if you think you are not a good walker – especially under the sun, we would like to recommend you to take a bus. You can take a bus number 82 or 53. The entrance of the temple is on “Thaawang” road; therefore you have to turn right on the “Mahaaraat” street. The entrance fee of Wat Phoo is 50 baht for foreigners. Some might like to try the traditional Thai massage so they have to pay extra for the service. Going to the 4th attraction, Bangkok City Pillar Shrine, on foot will take around 20 minutes from the east entrance of the temple on the “Sanaamchai” street. If you would like to skip this walk and go to the 5th attraction, the Royal Grand Palace and the Temple of the Emerald Buddha, you can just exit at the entrance and walk back to the “Mahaaraat” street. You have to walk all the way to the junction and turn right to the “Phralaan” road. However, if you are too tired to walk, you can take a bus, Tuk Tuk, or taxi at the gate. 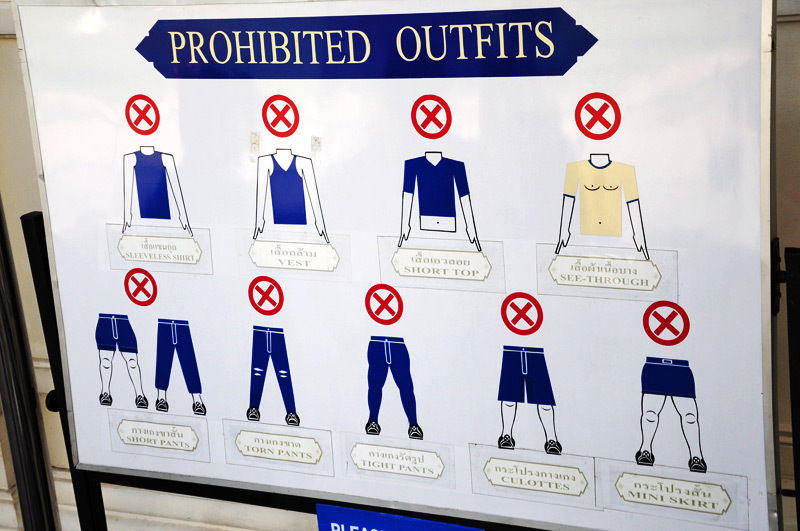 To enter the Grand Palace and the Emerald Buddha Temple, please see prohibited outfits by clicking here. For lunch, you can enjoy many kinds of food at “Thaa Chaang” pier or “Thaa Phrajan” pier close to Thammasat University (the 6th attraction). From the Bangkok National Museum, you can take a bus to the 8th attraction (Phrasumeen Fortress) at the front of the museum or walk to the fortress by following the walking path. At the end of the “Raachinii” street, there is the Bangkok Tourist Division where you will find all information of Bangkok. The area around Phrasumeen Fortress is known as Santi Chaiprakan Park. You can appreciate the view of sunset with the beauty of King Rama VIII Bridge. Around this area, there are some pubs and restaurants where you might love to get some drinks and snacks or to have a dinner. To reach the final destination, “Khaausaan” Road, you have to walk back to “Raambuttii” Soi and walk all the way to “Jakkraphong” street. On Jakkraphong street, please turn right. About 400 meters on the opposite side you will see the police station where the starting point of Khaausaan Road is. Enjoy your night! Below the map is the brief information of the 9 attractions from Bangkok Tourist Division. The King Rama I Monument is dedicated to the king who founded the Chakri dynasty and established the capital in Bangkok in 1782. Paakkhlooangtalaat used to be the largest fish market at one time. At present, it is transformed into the largest wholesale flower market in the country and it is a wholesale vegetable market as well. Wat Phoo (Wat Phrachettuphon) has lots of accounts and plenty of interesting anecdotes. It is the royal temple of King Rama I.
Bangkok City Pillar Shrine is an elegant looking temple in Bangkok. Keeping in accord with the ancient Thai tradition, that the establishment of a new city should always be followed by the erection of a City Pillar, King Rama I had the City Pillar raised on 21 April 1782. It is the respectable and national temple of Bangkok located within the same premises as the Grand Palace, a sacred and revered site of the entire Thai people. To visit, it is important to dress properly. No sleeveless tops, singlet, and shorts are allowed. Thammasat University is Thailand’s second oldest university. It was founded in 1934 as University of Moral and Political Sciences by Pridi Banomyong. Since its establishment, more than 240,000 students have studied in this university, including several Prime Ministers, Bank of Thailand governors, senior politicians, officials and specialists in all fields of academics. The Bangkok National Museum is the main branch museum of the National Museums in Thailand. It features exhibits of Thai art and history. In the area around Phra Sumen Fortress, there is a shady public park known as Santi Chaiprakan Park. From this point, we can appreciate the beauty of Rama VIII Bridge and the sparkling light of the sunset riverside here. Khaausaan Road becomes a tourist attraction for foreigners from various countries all over the world to look for a wide range of guesthouses at different prices. It also offers a wide variety of cheap merchandise ranging from purses, shoes, clothes, trousers, to handmade accessories.